A conversation with Brian Kelly led to a quick refresh of the Twitter Subtitle Generator (iTitle) [I’ve got tired of linking to all of mine and Tony’s previous posts on this so started the Twitter subtitling wikipedia entry]. Brian was interested in using iTitle to create twitter captioned versions of videos from IWMW10. Their plan was to use Vimeo to host the videos as it allows upload of videos greater than 10 minutes. This led me to update the iTitle code to include the timeline jump navigation which I originally developed for YouTube videos. More importantly I thought it would also be useful to include the ability to embed the results in other websites. With the introduction of the timeline jump navigation using the typical <embed> code you see with YouTube video isn’t possible (also I’m also using the HTML5 version of Vimeo videos which also doesn’t <embed>). To display just the video player with twitter subtitles I was able to <embed> code for the YouTube videos as they are Flash based. The JW Player which I use for playback has a ‘viral plugin’ which can generate the embed code (and send email links). 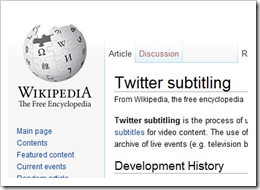 A big plus point is that it preserves the link to the Twitter subtitle file. The player only version of Vimeo uses <iframe> again. With all these embed options I leave it to the author to decide if they link back to the original. Well, this is remarkable. Inspired to try getting our seminars working as smoothly as this. Although, come to think of it, most scientists seem to be rather tech-unsavvy when it comes to social media and the internet.